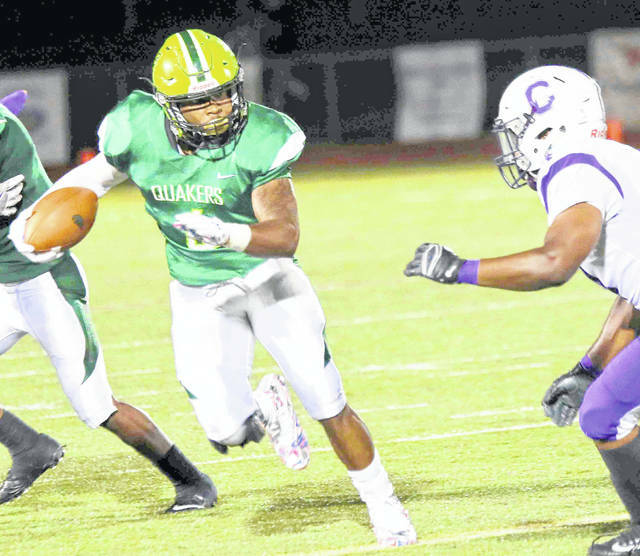 Running back Gino Hinton is one of the top returning players in 2018 for the Quakers. For one game, Wilmington College football knows how the others teams in the Ohio Athletic Conference feel. Wilmington will travel to Richmond, Ind. Saturday to open the 2018 season against Earlham in the first Quaker Bowl rivalry game between the two schools. When head coach Bryan Moore looks across the field at his maroon and white counterparts, he’ll see what the OAC sees looking at Wilmington. Moore is truly wary of the Quakers from the west. Wilmington rushed for 381 yards in a 49-20 win over Earlham last season at Townsend Field. Earlham hasn’t won a game since 2013, a string of 43 straight losses. In 2017, Wilmington finished 2-8 and ended a 40-game Ohio Athletic Conference losing streak with a Week 3 win over Capital. Earlham head coach Nick Johnson is in his fourth year at the helm. Johnson played his collegiate football at Wilmington from 1997-2000 and later served as the program’s defensive coordinator from 2007-12. Game set to kickoff at 2 p.m. Saturday at Earlham’s Darrell Beane Stadium. Wilmington is 11-8-2 against Earlham in the last 21 meetings. The all-time series record is in Earlham’s favor 25-15-2. Despite having so many starters returning, Earlham must replace Wesley Hundley, a do-it-all quarterback who accounted for more than 85 percent of the team’s offense. Moore said Clinton-Massie graduate Luke Richardson has “really distanced himself” on the offensive side of the ball for the Quakers.